TheTamshee's: hike continued onwards to Nelsons Monument expecting on arrival to be able to climb the 217 steps to experience the breathtaking views but this was not to be. The only question to be answered is; why does Britannia face inland ? it would seem logical that she faces towards the sea. "Wish" by Norfolk based sculptor Alison Atkins. At this point take the narrow path beside the eastern shore of the loch. Left side of the photograph below, this photo is taken, looking back up the Loch of the Lowes as the sun sets. Finally arriving back at the old stone bridge at the Tibbie Shiels Inn. TheTamshee: visited the Queens Gallery @ Holyrood Palace to check out "The Heart Of The Great Alone" charting the ill-fated Antarctic expedition of Robert Falcon Scott aboard the Terra Nova (1910) and a few year later in 1914, Ernest Shackleton embarking on his Transantarctic expedition in the Endurance. 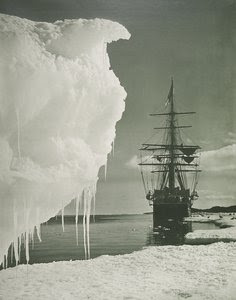 Brilliant photography and verse ( The sleeping Bag ) by Herbert Ponting ( Scott ) and Frank Hurley with Shackleton. TheTamshee: set out early to hike around Salsibury Crags and sit aloft Arthur's Seat to view the city from Edinburgh's highest point. to watch the Swans struggling to break free from the frozen loch and gain a foot hold on terra ferma. 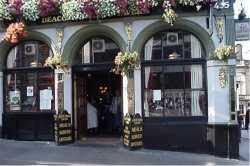 The history of St Anthony's Chapel then up the Royal Mile to get some quality leek & potato soup at Deacon Brodie's. TheTamshee has been checking out some fantastic art @ the Flaubert Gallery in Stockbridge Edinburgh. 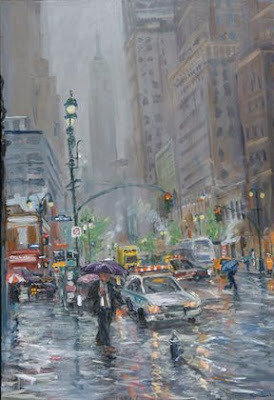 Click title link for the current feature artist "Blythe Scott" and the equally talented Hendry Kondracki capturing the atomsphere of 9th Avenue on a rainy day.